India will be celebrating its 72nd Independence Day on 15th August 2018 and celebration of India’s coveted freedom will be beginning at Asian Business School from 11th August itself. Asian Business School believes not only in imparting quality education but also in making its students conscientious citizens of the nation. 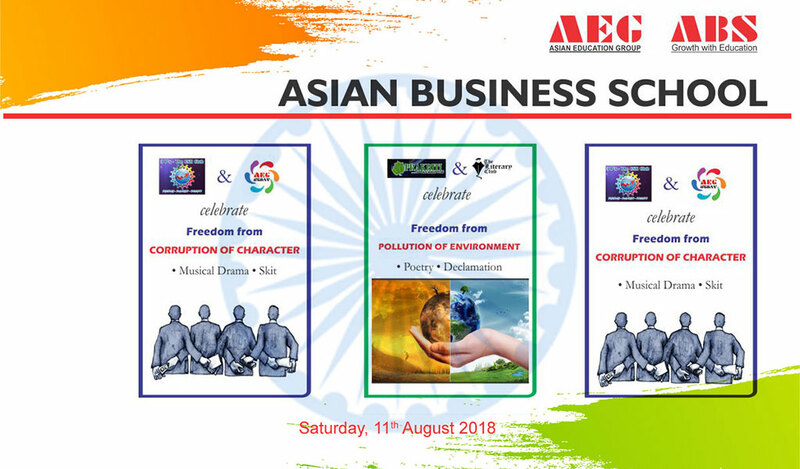 Keeping this vision in mind, various clubs at Asian Business School will be organizing multifarious activities to mark the Independence Day Celebrations. CSR & Utsav clubs are making an effort to raise a voice against corruption and celebrate “Freedom from Corruption of Character” with a purpose to impart deep understanding about various social issues related to corruption. Students of PGDM I are participating with full enthusiasm to display this through diverse dramatics in the form of street plays and musical dramas. Taking this initiative forward, the Eco Club “Prakriti” and Literary Club “Gnosis”will be organizing a declamation and poetry competition for the students on 11th August 2018. There is a great enthusiasm seen in the students for their performances on the theme “Freedom from Pollution of Environment” which will encourage stewardship in the audience towards maintaining a healthy environment. The third event in line is the Sports Start –Up Plan Competition being organized by Entrepreneurship Club “SEED” in association with Sports Club “Athleema” within the campus premises. Theme of the activity is “Freedom from Unemployment”wherein students in small groups would come up with Business Plans for a Start-up related to Sports Industry. Main aim of this activity is to develop an entrepreneurial mindset in students and raise their interest in Sports related business opportunities which can lead them to be job creators for future India. ABS is proud of being able to contribute to the growth of free India ! !